Drift (ドク, Doc) is a jock frog villager in the Animal Crossing series. He made is first appearance as an islander in Doubutsu no Mori+ and has made an appearance in every subsequent Animal Crossing title to date. His name may come from his original role as an islander and his catchphrase comes from the sound a frog makes combined with "bro", a term that jocks commonly use in conversations. Drift is a frog with orange, yellow, and brownish gray colored markings all over his body and face in what looks like a "smeared on camouflage" design. He has a huge smile and initially wears the No. 67 Shirt, which is scarlet with a light blue 67 on it. In Doubutsu no Mori+, Animal Crossing, and Doubutsu no Mori e+ he wears a Blue Aloha Shirt, as he is a male islander. 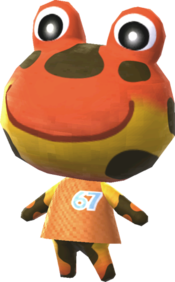 Drift has a jock personality, which means he will have a keen interest in sport and fitness, making him appear competitive and in some cases rude when talking to other villagers, usually criticizing their fitness. He will appear slow-witted and absent-minded when talking about deep, meaningful things. He will get along well with peppy villagers, but get confused by the choice of lifestyle followed by lazy villagers, who appear opposite to the jock personality. He may offend and upset snooty and cranky villagers. Drift's house is mainly western-themed. It contains a Mini Drilloid, Watering Trough, a Wagon, some Broken Posts, and other old western-themed furniture. He has the Western Vista (wall) and Western Desert (floor). If given a music-playing device, he plays the song K.K. Country. 167px Have one to add? Modified on November 29, 2018, at 03:34.